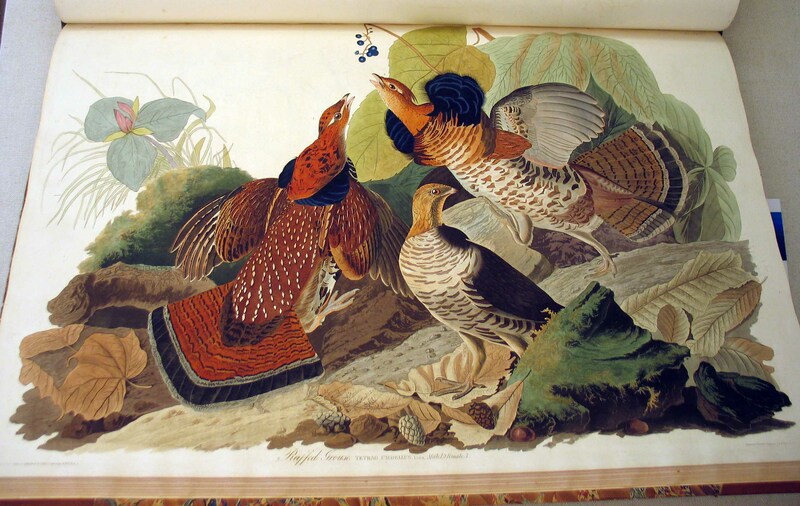 “You are now presented,kind reader, with a species of Grouse, which, in my humble opinion, far surpasses as an article of food every other land bird which we have in the United States, except the Wild Turkey, when in good condition. You must not be surprised that I thus express an opinion contradictory to that of our Eastern epicures, who greatly prefer the flesh of the Pinnated Grouse to that of the present species, for I have had abundant opportunity of knowing both . . .
–J. J. Audubon, Ornithological Biography, I (1831), 211 [excerpted]. 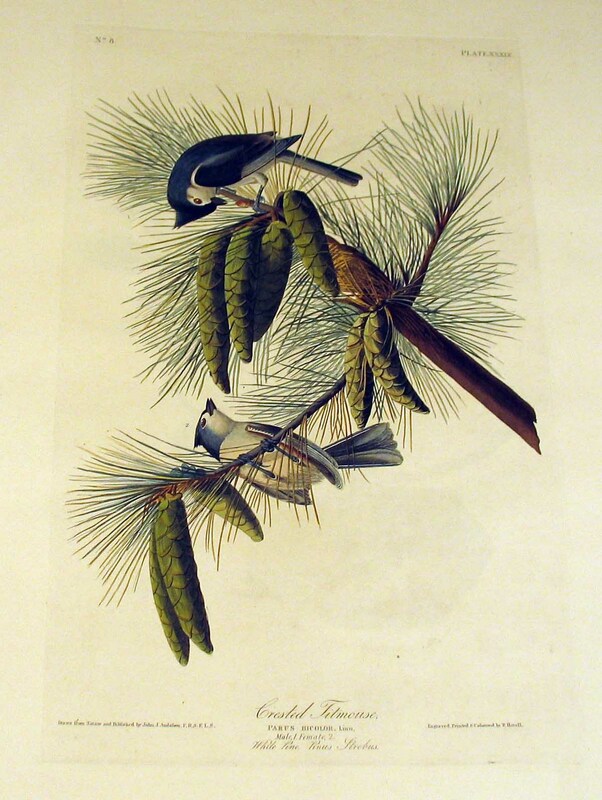 “This is one of the most lively, as well as one of the handsomest, of our Fly-catchers, and ornaments our woods during spring and summer, when it cannot fail to attract the attention of any person who may visit the interior of the shady forests. . . . It keeps in perpetual motion, hunting along the branches sidewise, jumping to either side in search of insects and larvae, opening its beautiful tail at every movement which it makes, then closing it, and flirting it from side to side, just allowing the transparent beauty of the feathers to be seen for a moment . . .
–J. 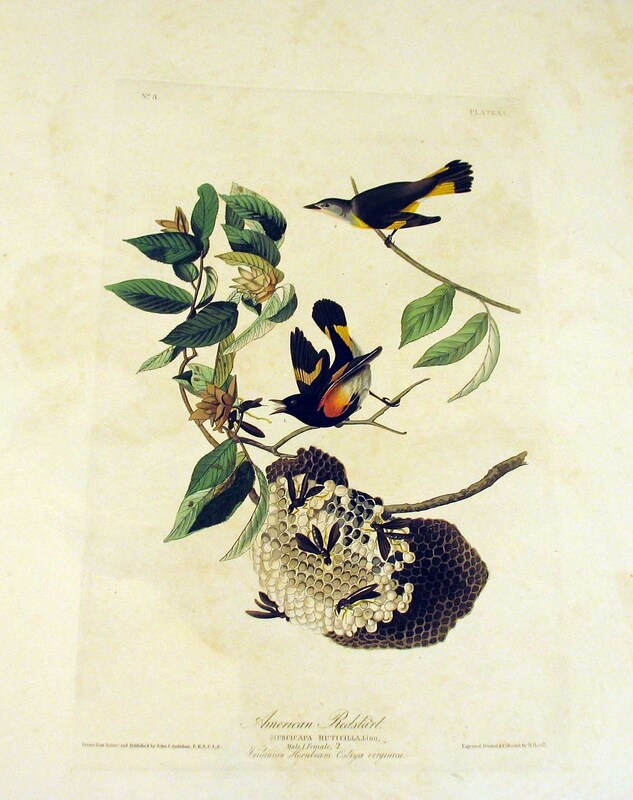 J. Audubon, Ornithological Biography, I (1831), 202-203 [excerpted]. “Although this smart little bird breeds in the State of Louisiana and the adjacent districts, it is not there found in so great numbers as in the Middle States, and farther to the northward. It generally prefers the depth of the forests during summer, after which it approaches the plantations, and even resorts to the granaries for corn.
. . . They move about in little companies formed of the parents and their young, eight or ten together, and escorted by the Nuthatch or the Downy Woodpecker . . .
. . . This species sometimes forms a nest by digging a hole for the purpose in the hardest wood, with great industry and perseverance, although it is more frequently contented with the hole of the Downy Woodpecker, or some other small bird of that genus. It fills the hole with every kind of warm materials, after which the female deposits from six to eight eggs, of a pure white, with a few red spots at the larger end. –J. J. Audubon, Ornithological Biography, I (1831), 199-200 [excerpted]. “This beautiful species is the most common and abundant that visits the state of Louisiana and those situated on the borders of the Mississippi. In Kentucky it is much less common, and in the state of Ohio, scarcer still. It is an extremely active and lively bird. It is found in all the low grounds and damp places near water-courses, and generally among the tall rank weeds and low bushes growing in rich alluvial soil. Continually in motion, it is seen hopping in every direction from stalk to stalk, or from one twig to another, preying upon insects and larvae, or picking small berries, seldom, however, pursuing insects on wing . . . It arrives in the southern states, from Mexico, about the middle of March, and remains with us until the middle of September, during which time it rears two broods . . .
–J. 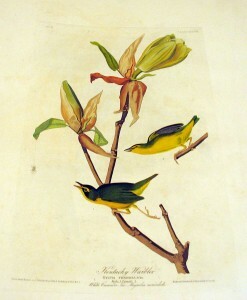 J. Audubon, Ornithological Biography, I (1831), 196-197 [excerpted]. You are currently browsing the The Bibliophile's Lair blog archives for July, 2012.